I start with a quick mention and a link for those who just want to get there. 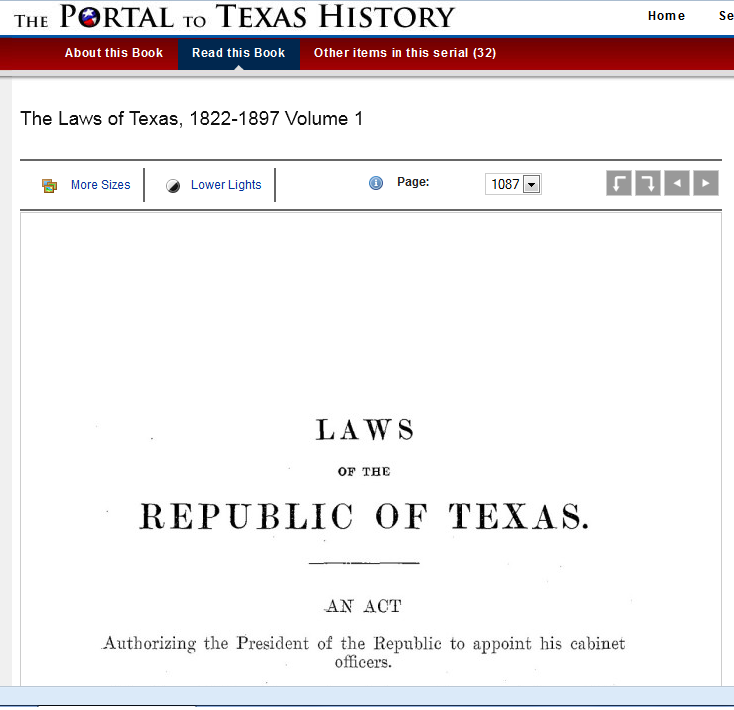 Hans Peter Mareus Neilsen Gammel was a gentleman kind enough to publish books of the laws of Texas before the republic, during the republic, and in early statehood. The University of North Texas is a university kind enough to make that available to us online. 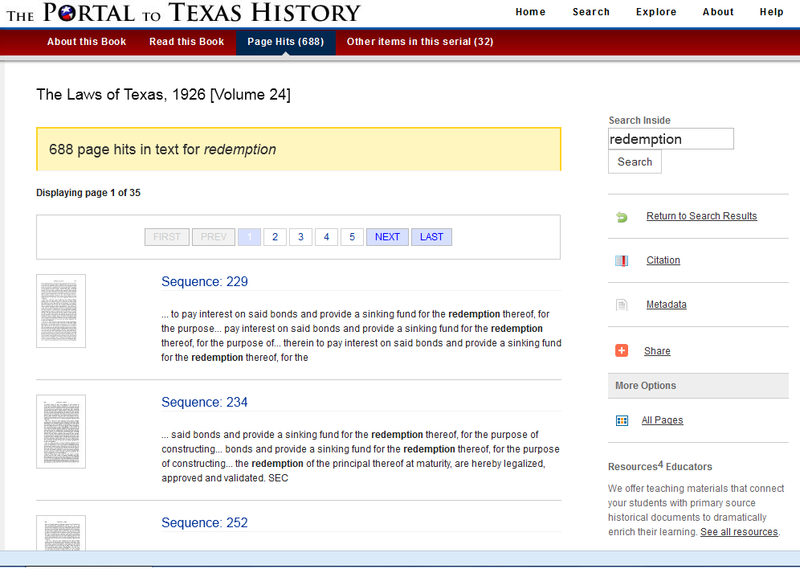 You can both search and browse the statutes. For those who enjoy a more leisurely stroll before jumping into such matters, I offer a bit of background on Mr. Gammel, courtesy of Wikipedia. Originally born in Denmark, he moved in his adult life to the United States and eventually settled down in Austin, Texas. His notoriety (limited though it may be) started with a fire. At the time, he had set up a stand in Austin selling writing paper, bits of jewelry, lemonade, and books. I'll let Wikipedia take it from here. In 1881, the old Texas State Capitol burned to the ground. In order to earn a little extra money to help support his growing family, Gammel took the contract to haul away the debris. Gammel gathered papers and charred documents from the debris scattered on the Capitol grounds. He loaded them in a wagon and took them to his home. He and his wife gradually dried the pages on a clotheslines and stored them with their belongings. 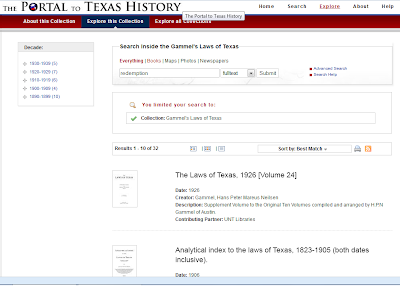 Gammel sorted and edited the crinkled papers, then published them beginning in 1898 as the first ten volumes of Gammel’s Laws of Texas, 1822-1897. 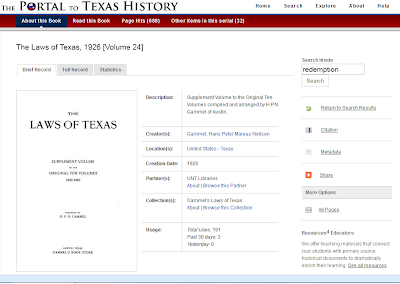 Before 2001, in order to research these early Texas laws, you had to (1) know they existed, (2) be extremely good friends with one of the few people who had a copy in their own personal collection, and (3) fervently hope you did not destroy the brittle pages in the process. In 2001, the University of North Texas eliminated two of those requirements. Hopefully, this article will help eliminate the other for a few more people. As I mentioned, you can both search and browse the collection. 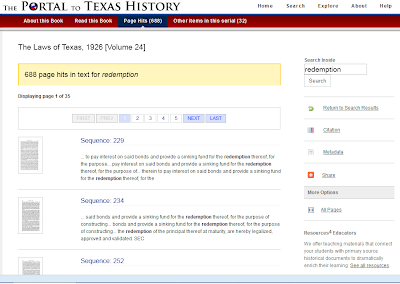 The University of North Texas at the moment has the first twenty volumes. 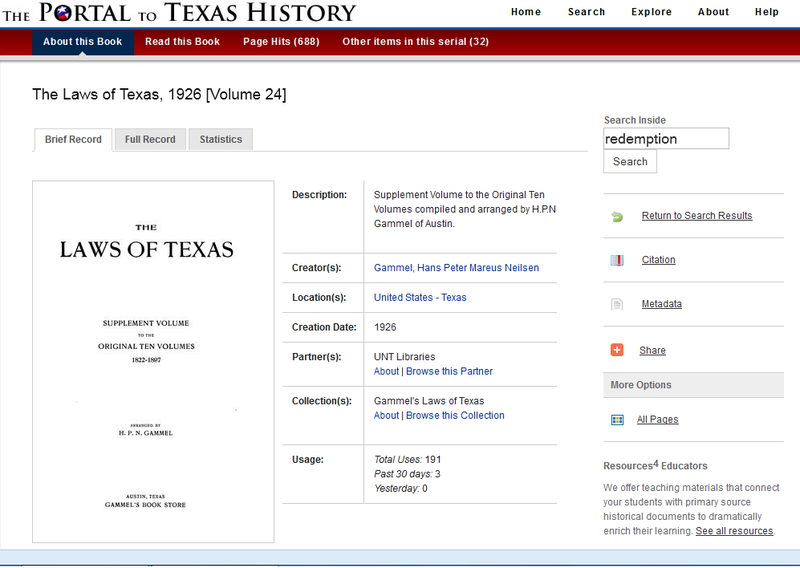 More precisely, it lists twenty volumes that you can browse, but its search page indicates you can search the first 31 volumes. While this certainly doesn't suggest the impossible, it does leave a few blanks. Browsing is simple enough. Though I expect this route will mostly be for history enthusiasts, it can be entertaining. 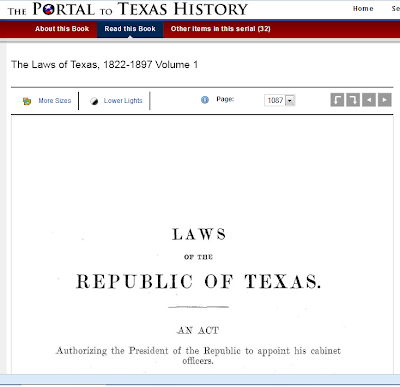 How else would you discover that the Republic of Texas passed an act whose sole purpose was to allow Erastus Smith "usually known and called 'Deaf Smith'" to pick any house of his choosing in the city of Bexar? You can navigate by selecting a page from the drop down, using the buttons along the top right, or by moving your mouse to the right or left of the page and clicking there. 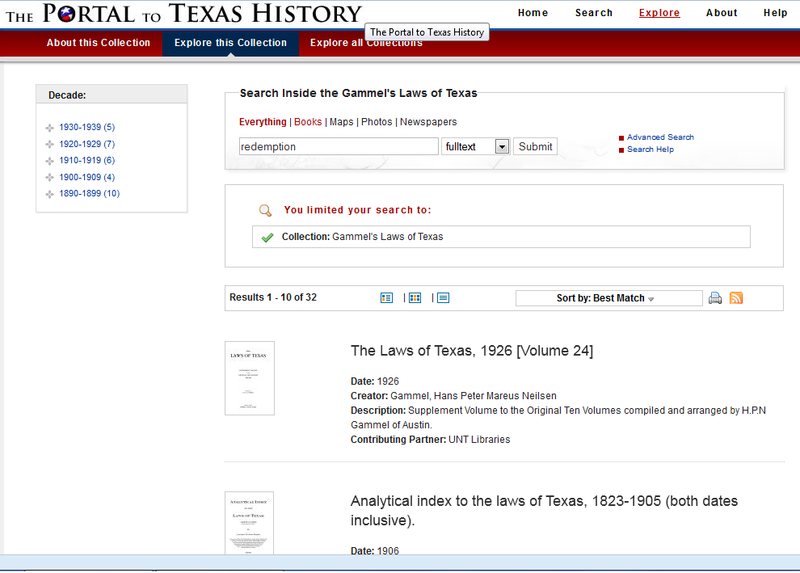 You can also browse Analytical Index to the Laws of Texas, 1823-1905. This was published at the same time as the first ten volumes, though it covers the first twelve volumes. From there you can select specific pages to browse. The search terms should appear highlighted on the page. With any luck, you will never need to write a brief that depends on citing to early Texas law as your strongest legal argument. But it never hurts to know how. Next column: A quick way to enter legal citations in Microsoft Word.